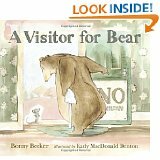 A Visitor for Bear is a fiction/animal fantasy picture book written by Bonny Becker and illustrated by Kady MacDonald Denton. It tells the story of a bear who lives alone and does not like visitors, and a mouse that comes to visit and won’t go away despite the bear’s insistence that he does not want the mouse in his house. Finally, the bear lets the mouse stay and the two become friends. This is an appropriate book for young students who are beginning to learn about the design process because the plot is straightforward and presents simple yet engaging design challenges. Bear's pretty good at keeping people away. No one ever visits him, and just in case one does he has a big sign in front that reads, "NO visitors allowed". Just in case. Everything is fine and dandy until one day a mouse "small and gray and bright-eyed" knocks on the door. Bear says in no uncertain terms that he is not keen on visitors. The mouse seems to understand, but when Bear attempts to get out a bowl for himself, there sits the mouse asking for a spot of tea. After throwing out the unwanted guest Bear tries to open his bread drawer next, and there again is the mouse! To Bear's increasing frustration the mouse is absolutely everywhere, and no amount of stopping or locking keeps him away. At last, Bear consents to having a bit of tea with the miniscule visitor and soon discovers that the mouse is attentive, easily impressed, and laughs at Bear's jokes. And when it is time for the mouse to go, Bear finds himself unceremoniously ripping down the "NO visitors allowed" sign. After all, he says, that is a sign for salesmen. Not for friends. · The bear needs to find a way to stop the mouse from getting into his house. · The mouse needs a way to stay in the house.